Healthy and nutritious snacks don’t have to break the bank. While the prices of individual healthy snacks are typically higher than those of their processed-food counterparts, after school programs are teaching kids how to make easy, delicious and most of all healthy snacks. Start by teaching kids why it’s important to substitute juice for water. Water is great for so many things. For starters it will keep you hydrated, flush out toxins from your body, increase metabolic rate and help reduce risks of many diseases and ailments. Milk is also a great option for kids to drink instead of juice. Milk is tooth friendly and packed with vitamins and minerals like calcium, which can build and maintain healthy bones and teeth. Now what about the food? That’s the most important part, right? After school programs, like DREAM, want to teach your kids how to eat well without reaching for candy, cookies or chips. Below are three great recipes that are healthy and will keep your kids full until dinner. Heat oven to 250 degrees. Stir together Chex, popcorn, both kinds of Goldfish and bagel chips. Whisk together butter, syrup, soy sauce and cinnamon. Drizzle that over your Chex mixture and stir it well. Spread your mixture onto a rimmed baking sheet and bake it at 250 degrees for 40 minutes, stirring every 15 minutes or until golden. Let it cool completely. This recipe is a favorite for many after school programs. It is the perfect combination of sweet and salty, plus it is so much healthier than store bought Chex mix. With this recipe you’ll get 16 servings per recipe, and it’s only 142 calories per serving. Stir yogurt, peanut butter and maple syrup or honey until no lumps remain. 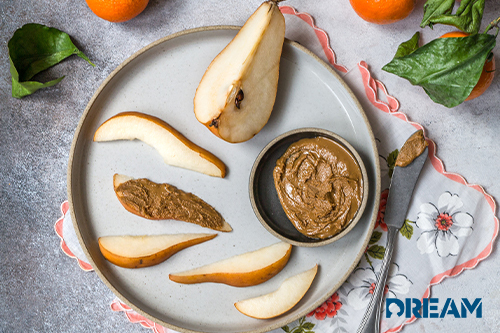 Serve with an assortment of healthy dippers like a sliced apple, celery, carrots, crackers or pretzel sticks. Store in an airtight container in the refrigerator for up to one week. That is, if it even lasts that long in your house. After school programs love to suggest using dips at home for all meals too. Especially if you have a picky eater. Using a dip can help empower a child to make good choices at mealtime. Using dip is one of the best feeding therapy strategies. Mix together the cream cheese, yogurt and ranch powder. Spread a spoonful of dip over each tortilla. Sprinkle the cheese and bacon on top of the dip. Place two slices of ham and two slices of turkey on each tortilla. Then layer some lettuce on top of the meat. Gently roll up and wrap in plastic wrap. Cut each tortilla into six pieces. Top them with a toothpick and a grape tomato. Then store them in a sealed container in the fridge. Turkey club pinwheels are a great after school snack. They are also great for packing in lunches too. There is just something fun about eating bite sized foods. This recipe is great for after school programs due to its versatility too. You can customize the meats and cheeses to offer up different tastes, the dips on the tortilla can be altered and the can be dipped in other condiments. Stir together gelatin and peach juice in a microwave safe bowl. Microwave the combination on high for one minute. Stir in the agave and set it aside for five minutes. Combine the peaches and yogurt in the blender. Puree this combination until smooth. With the blender running, add your gelatin mixture in a thin stream. Pour the mixture into ice pop molds, place the sticks carefully into the center and freeze them for 6 to 12 hours. Mix peanut butter, maple syrup and ⅓ cup water in a saucepan over medium-low heat. Stir until peanut butter is melted and ingredients are combined. In a large bowl, mix together oats, sunflower seeds and quinoa. Stir in peanut butter mixture until combined well. Line two 12 cup muffin tins with paper wrappers. Scoop 2 tbsp of peanut butter and oats mixture into each wrapper, pressing down well with a spatula. Spread 2 tsp of the preserves over peanut butter and oats mixture in each cup. Add 2 more tbsp peanut butter and oats mixture to cover preserves, pressing down well with a spatula.